Voornaamste verkoopargument 4 x PCIe mini card slots enable a host of connectivity options that are customer upgradeable providing a strong foundation for future growth requirements. Voornaamste verkoopargument A wide voltage solution supporting 9 to 36 Volts DC input. Voornaamste verkoopargument Complete solution out-of-the-box that is easy-to-use and quick-to-deploy including a universal DC and AC power kit (USA, UK, EURO and JPN) as well as a universal mounting kit in support of DIN and wall mount applications. Voornaamste verkoopargument Customers are able to take full control and adapt to changes quickly. Voornaamste verkoopargument Customers can review and address scenarios from any part of their business, giving them the power to stay agile and tackle issues if they arise. Voornaamste verkoopargument Delivers a performance solution that comes optimally configured with an lntel® i5 CPU, 8 GB RAM, 64 GB SDD Storage, Wi-Fi connectivity (standard on Wind River SKU) and an expansive I/O selection including four-port Power over Ethernet (PoE) plus 1 x 8 bit digital input/output (DIO). Voornaamste verkoopargument The HPE Edgeline EL20 Intelligent Gateway enables customers to analyze data streams in real-time, so that they can make sound decisions with reliable analysis. 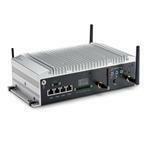 Voornaamste verkoopargument The HPE Edgeline EL20 Intelligent Gateway is a mid-level level ruggedized compute solution designed for light data aggregation and acquisition.